Dofus tells the backstory of how Moon Island came to be. DOFUS offers incredible challenges, exciting quests, and an engaging world to explore. The Krosmoz is like no other world! Are you ready for some adorable pets? 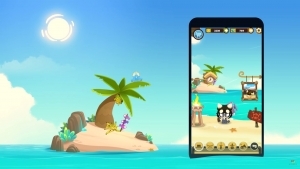 DOFUS Pets is an app you can download to take care of some truly cute pets! You can find it right here. The Sidimote Moors got a complete overhaul, and each of the ten sub-areas has its own look and own monsters. Adventurers from 40-200 can go there in DOFUS.